With ever increasing Stress in Life thanks to the hectic lives we lead in today’s world, one of the most common problems which are seen in one out of five people around the world is bruxism or teeth grinding or night grinding. Most patients do not realise it until they see signs of their teeth wearing off or the other sign being pain in the jaw accompanied with headache which cannot be related to any other causes. It becomes difficult for the Dentists to diagnose the exact reason causing the attrition as most of the patients refuse to recognize that they are either grinding their teeth during sleep or in day time. The other major cause of wearing off of teeth is in case of GERD where the regurgitation of acid from the stomach leads to attrition and the treatment differs based on cause. A Team of Researchers from the University of Florida have created a smart mouth guard which will help in detecting bruxism, it is found that most of the patients suffering from night grinding are suffering from Stress and it plays a relatively major role in bruxism according to American Pschological Association. Earlier to diagnose it patients needed to be monitored overnight in a sleep clinic which was not comfortable and intrusive for the patient. 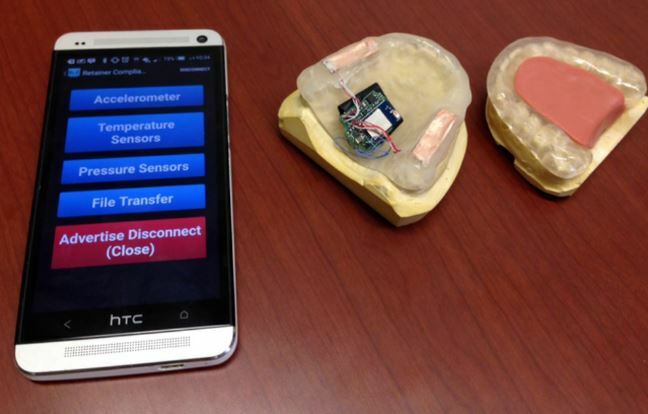 The researchers from the University of Florida have made a mouthguard which is given to treat bruxism equipped with a sensor to detect the amount of force being applied by the teeth as well as the exact teeth which are exerting the force. These readings can be seen by the Dentist on their mobile device which is very useful and a much easier process to detect grinding of teeth. Such mouthguards are already used in sports like football to detect the amount of forces affecting the head in contact sports. Similar sensors are used in a mouthguard which is regularly given to patients suffering from Bruxism making it a win-win situation, information can be obtained while treating the condition. The Smart Mouthguard has also won the second place in a competition held for applications for microtechnologies in Anchorage, Alaska. This can be very useful in clinical practice to diagnose and treat bruxism in a precise manner. There is no information about the availability of the mouthguard and what it would be priced at.